Used in some Bally and Williams games for mid-range power devices like slingshot bumpers, pop bumpers on some games, ball kickouts, and more. Can be used to replace older obsolete Stern # J-27-1200. 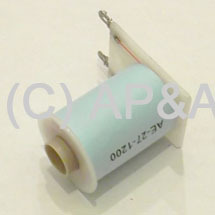 Available with or without diode across solder lugs (select above when ordering- ships without diode by default).